When buying gold bullion it is important to know the main reason for buying. If the main goal of buying gold is to preserve your wealth it is recommended when buying gold coins or buying gold bars that they are closest to spot price as possible. Spot price is the price what one troy ounce of pure gold is selling for at the time you buy. A troy ounce is equal to 31.1034768 grams. 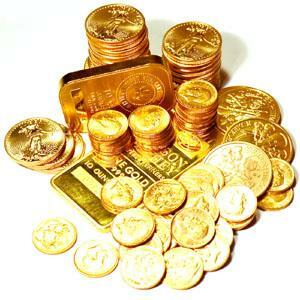 When it comes to gold coins you are not only paying for the gold but the manufacturing of the coin. This is why gold coins are usually more expensive than gold bars. The good thing about gold coins is they are usually easier to sell than bars. When buying gold coins it is recommended that you buy coins minted by a mint that’s been around for a while and has a good reputation. Some other things that are recommended is that you buy pure gold coins and minted in the country you intend to sell it, if not in the mint closest to the country where you intend to sell. Pure gold should say 99.99 or 999.99 and also be 24 Karat. Some gold mints will have coins with the amount of gold stated in addition an alloy of silver and copper to produce a more wear-resistant gold coin. These coins will be 22 Karat and will be less than 99.99 pure. When buying gold bars you usually get more gold for your money compared to buying coins. If you buy gold bars it is recommended only buy 999.99 (24 Karat) bars. It is important when you buy gold that you get physical possession of the gold. This way you don’t have to worry about any company going out of business or any government seizing your gold for any reason. Buying gold bullion is one of the best way to preserve your wealth from inflation of a currency or any other economic downturns a society might face.